Arteries bring oxygenated blood from the heart to the rest of the body. Veins bring oxygen-depleted blood back to the heart. Veins have one-way valves (check valves) that keep blood flowing back up the legs towards the heart. When the valves fail, the blood leaks back down the legs and “pools”. This puts pressure on your veins, and over time they can weaken and bulge. In the legs, for example, this can result in visible varicose veins and significant symptoms or complications such as blood clots or ulcers. Aren’t varicose veins simply cosmetic? Most varicose veins are not cosmetic. Symptoms from vein disease can impact your quality of life and affect your ability to function normally. Most varicose veins are treated for symptoms or complications, which is usually covered by insurance. Of course, there are some people who don’t have symptoms; for them treatment would be cosmetic. Can you be affected by varicose veins and not even know it? Your legs might feel tired, aching or heavy as the day progresses and you might just attribute it to getting older. Often you don’t make the connection between the symptoms and vein disease. Also, you may have ulcers or wounds near their ankles which can be caused by abnormally functioning veins. Finally, swelling of one leg with or without a history of blood clots can be due to narrowed or blocked veins. Why do my legs feel good in the morning and bad in the evening? Patients often say ‘in the morning I feel good, but as the day goes on…’. At night while you are sleeping your legs are elevated and gravity is helping to drain the veins of extra blood that accumulated during the day. If you have poorly functioning veins, the more you are on your feet or sit at work the more you will feel the symptoms. Symptoms tend to get worse as the day progresses. It is true that at the end of the day you are carrying around more blood in your leg veins than when you woke up. It’s rarely a pain. It’s more of a tired, heavy, achy feeling. If symptoms are affecting your quality of life on a daily basis they should be treated. Living a healthy lifestyle always helps overall health. Unfortunately, there’s not much you can do to reduce the risk of developing varicose veins because the causes are primarily genetic. In addition, humans are at increased risk for varicose veins because we stand upright. Interestingly, animals who walk on all fours do not develop varicose veins. Many times, you won’t realize you have a clot. If you have any concerns or risk factors (like family history), be aware if your leg seems heavy, tired or swollen after sitting in a car or plane for a long time. Your calf may become tender. Being in a hospital bed for a long period of time or being in a leg cast can also increase your chances of developing a clot. Family history. This is really the main driver of vein disease. If you have one parent with history of vein disease your chances are 35%, if you have two parents with vein disease your chances of developing varicose vein go up to 95%. Multiple pregnancies. During pregnancy, weight, blood volume and hormones all increase, which can increase the stress on your veins. Obesity. Being overweight increases the pressure in your veins and can put you at risk of getting varicose veins or worsen their appearance. Secondary causes. Hormone replacement therapy and birth control alter the regulation of hormones. This may increase the stress on veins and may contribute to why varicose veins are more prevalent in women than men. What should I know about veins? 25% of men and 40% of women (estimated) have some form of vein disease, which becomes more prevalent as we age. What are the latest treatments for vein disease? Minimally invasive technologies for treating vein disease really came into play in the early 2000s and the technologies get better each year. For almost any procedure you have at Englewood Health, there will be no cuts, no stitches, just a few needle sticks, local anesthesia and the whole procedure will take about 30 minutes. You’ll walk in and walk out and be back to just about anything you want to do the next day or two. There are a few vein procedures that may require 2-3 very small (3mm) incisions. Why choose the Center for Vein Disease at Englewood Health? Englewood Health has a dedicated vein center, located at Englewood Hospital, led by a board-certified vein specialist. We are a high-volume center with highly experienced physicians, offering the full range of the newest treatment options before most other providers can offer them. Our patients have access to our clinical trials, including participation in industry trials. This means our patients can get the newest technologies sooner, with a surgeon who is highly experienced in using a range of treatments. We provide tailored care for the individual patient’s need with the best technology for them because all current minimally invasive technologies are offered. In addition, we train physicians — from around the country and the world — who come to learn the newest techniques at Englewood Hospital. What’s the most important thing I should know? All veins can be treated. Some technologies are better for curvy, straight, small, or big veins. At Englewood Hospital, with these technologies we can treat every single vein in the body (except those in the heart or brain which are treated by other specialists). 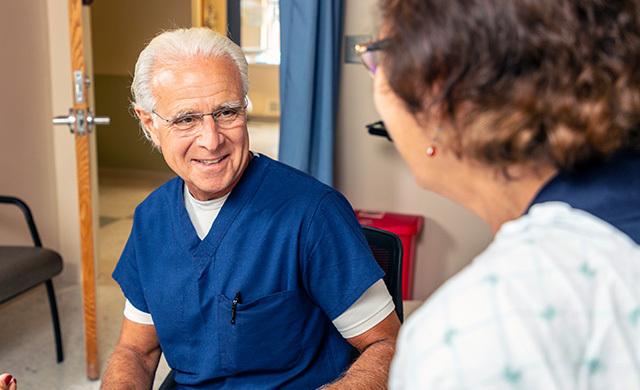 Even if a person has had blood clots (and scarring from those clots) or ulcers that keep coming back, we can treat these affected veins with minimally invasive tools to alleviate symptoms and prevent recurrence. People tend to accommodate and live with symptoms. However, once they are treated, most patients find they feel that the leg is lighter with more energy. As far as risks for most vein procedures, simply put, if you can go to the dentist you can have a vein procedure. If you have your veins treated for the right reasons, by the right doctor using the right technologies, you will have a significant improvement in symptoms, looks, and prevent further complications from vein disease.